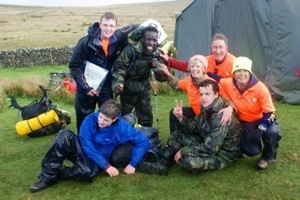 Cadets from Bristol and Gloucestershire Wing successfully completed the Ten Tors’ challenge over the weekend of 10/11 May 2014 despite extremely demanding weather conditions including 70 mph winds and driving rain. The night before they set off their sleep was disturbed when because of heavy rain causing them to move tents in the early hours. Not put off six cadets drawn from 186 (Newent), 2392 (Thornbury), 2467 (Nailsea) and 2494 (Portishead) headed off on a 45 mile route across difficult terrain and after Herculean efforts completed the course with two minutes to spare. Two cadets from 2152 (North Bristol) and 2494 (Portishead) Squadrons joined a team from 13 (City of Exeter) Squadron and completed the 35 mile route at 3 pm on Sunday. The fantastic results was the culmination of months of training and preparation led by a very dedicated staff team.